UPDATE 7:30pm: The government has released details which vary from the assumptions in this post. See this followup post. 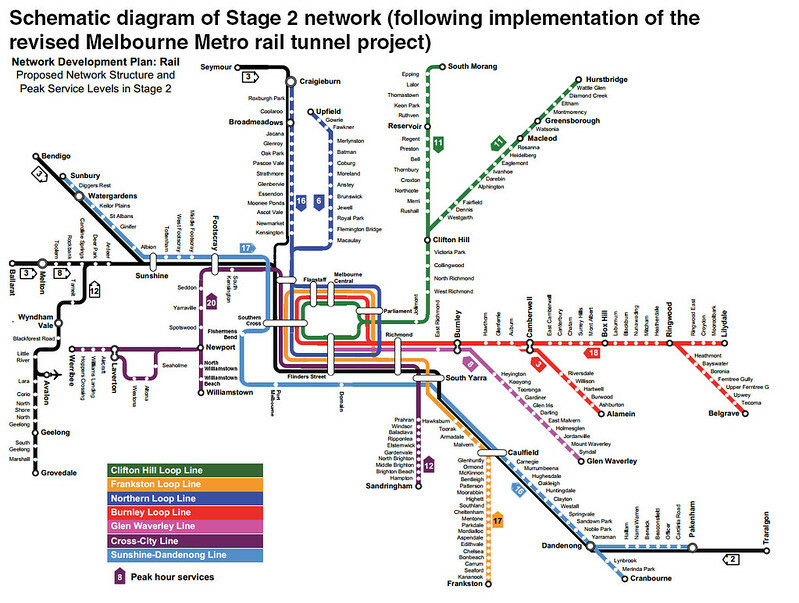 As some have feared, it looks like the Napthine government is about to stuff-up the metro rail tunnel, which is proposed to connect the Sunshine/Sunbury and Dandenong lines. WORK on a rail tunnel between Southern Cross Station and South Yarra will begin in 2016, the State Government will announce. The announcement of the tunnel, which will include stations at Fishermans Bend and the Domain, will be the centrepiece of a big-spending election year budget. This is fraught with problems. It avoids digging up Swanston Street. From what I understand, this is a real option, with the originally planned route running just under the surface down the street. For instance, trains would come through Melbourne Central Station at roughly concourse level. It would serve Fishermens Bend, which the government plans to be a major residential area within a few years. In other words, the Coalition’s version of the Arden precinct. But given the construction time might be 10+ years, presumably other options need to be provided in the meantime. It would solve the problem of getting the very busy Sunbury and Dandenong lines onto their own tracks. The key one: It bypasses the city centre. Two of the busiest lines would miss most of the CBD… you know, where a lot of those people actually want to go! The only CBD stop would be Southern Cross, which at present gets only about 16% of all CBD boardings. This in turn would place a lot of pressure on connecting train/tram services, guaranteeing continuing problems for the “last mile” of many CBD workers’ trips if using those lines. And bypassing the big hospital and university precinct is a huge missed opportunity. And in fact trips to that precinct from these two lines would become positively painful, particularly if, as on the diagram, there would not be a stop at North Melbourne. It’s a looooong detour for Sunbury passengers going to Domain (perhaps even longer than their current journey), or for Dandenong passengers going to the city (even assuming they want the Southern Cross end). So in summary, it solves a couple of problems, but creates many others. And it’s unclear if it would be any cheaper. The original planned alignment has a big problem in the disruption it would cause, but that would only be temporary. Other than that, it ticks all the boxes. I’m assuming we’ll know for sure what’s planned when the Budget hits this afternoon. But if the above is correct, this is madness. If you’re going to spend billions on a major rail tunnel, do it properly. With construction not scheduled to start until 2016, no matter who gets power in November, they’d be well-advised to review this option and switch back to the original alignment… or at least a better one. I’ll be watching from afar today. I had planned to join in the Spring Street shenanigans, but instead will be in Shepparton at a funeral for my good friend Tony’s mum, who passed-away suddenly last week. RIP Lois. On the glass half full side, possibly leaves Swanston St free for a more far-seeing Government to build Metro 2 via Parkville for the adjusted South Morang line as per the original expansion plans to free up space for Doncaster. No doubt going via Southern Cross makes it easier to tie the Airport rail into this line as well perhaps? As a resident along the Pakenham line, I was in great fear for my broken connection with Southern Cross station. Therefore, I should be greatful for the new alignment. This project is going to go ‘the long way around’ between South Yarra and Southern Cross. Would that not put off people big time? Would the longer route taken not be a great turn off for many people? It would be far better for Metro to send down half of the Franston trains and half of the Sandringham trains along that tunnel. Retain the current and direct connection as required by many, at the same time as providing the services via the tunnel too. 16% of all CBD boardings at Southern Cross? I’m not so sure that’s accurate anymore, based on what I see, and it’s growing. If they bypass the city center then what is the point. As someone who watches passengers get on and off trains every day I see where the original alignment will greatly benefit coming in from pakenham/cranbourne. Under this new alignment they may aswell not bother 75% of passengers get off before southern cross in the am peak. This new plan makes no sense as it bypasses the main areas people need to get to. I can’t see what is wrong with digging up Swanston Street didn’t we do similar for the City Loop in the first place. Although construction won’t start till 2016 are we going to be in a similar position to East West Link with contracts signed before the election? So what about the maybe 80% of people from Sunbury and Pakenham/Cranbourne who want to come into Flinders Street? They get screwed over by a tunnel they don’t need. This whole Metro Rail Capacity project is a joke. You can get from the North CBD to the South CBD by tram, the city loop services the CBD well. Why on earth is this project even needed when our current network isn’t being used to capacity? Until there is a train scheduled every 2 minutes all day every day, our network isn’t being used to its capacity – and until that point, we do not need to be wasting $11b on this farce. @Chris, I wouldn’t worry too much about contracts being signed on this one. That would oblige them to actually do something on public transport. 16% of CBD passenger traffic at Southern Cross might have been the case 3 years ago, but I suspect it would have increased significantly since then, given the relative growth of jobs based in the Docklands precinct in recent years. The plan for the Dandenong lines looks solid – going via Domain and Fishermans Bend might not be the most direct route but it solves the Richmond/City Loop congestion issue. Any passengers for Richmond/Parliament/Melbourne Central could presumably change at South Yarra anyway. Hopefully the Fishermans Bend redevelopment will include a tram line along Lorimer St, as that area is currently a PT back hole, save for a handful of buses. We didn’t dig up the length of Latrobe St to build the City Loop (just the station sites which were provided with diversions). Why do they keep using the spectre of digging up Swanston St as an excuse? Southern Cross may only have a low percentage of boardings and alightings currently, but the precinct currently has a few developments going up around the place and is slated for a lot more. It’s mainly apartments at the moment, but once a few high-rise developments pop up, it will only be a matter of time before offices and businesses start “filing the gaps”. In 10-20 years time it will likely be a very busy part of the city. Swanston Street trams might be slow moving, overcrowded mess at the moment, but that will hopefully be relieved somewhat by some traffic light priority measures, and by efforts to divert some routes to different parts of the city after domain interchange. So hopefully Swanston Street trams will be faster in the future, and people that need to get to the area around Flinders & Melbourne Central will still be able to without too much hassle. Also, people that currently catch the tram all the way into the city and want to get near Southern Cross, will have incentive to get off at D.I. and switch to the train, which might relieve some tram crowding. The other alignment followed the tram route, so the only reason to get off the tram would have been to get to Flinders Street or Melbourne Central slightly faster. However, there may be more people getting off the train and onto the trams rather than the other way around so there is a good possibility the chronic crowding on Swanston Street trams will actually be made worse. Fisherman’s bend is likely to be much better served under this arrangement than the PTV network development plan alignment, which was essentially a spur from Southern Cross built as part of the “maybe one day in the very far future” Doncaster Line. Also, Fisherman’s bend hasn’t really started development yet, so I wouldn’t expect the 10+ year construction stage for this plan to be too much of a negative, as it will probably still be half construction site then anyway. Hopefully some trams lines will be extended to the area as its being built though. Port Melbourne will get a train station. It might not be as much of an employment cluster as the hospital precinct, but it does house quite a few jobs, as does nearby South Melbourne. These pieces of food for thought aside, I mainly agree with you Daniel, it doesn’t seem a clever idea. Once again, it really annoys me that this option wasn’t even an “option” in the PTV network development plan. If the Coalition actually wants PTV to do its job, then either it needs to publish various options in its plans to show that they’re being considered and so the public can provide feedback; or the Coalition needs to actually listen to the body it established to plan network improvements. If it does neither it may as well have not established the body in the first place, unfortunately given the sheer number of projects popping up out of the woodworks at the moment it seems this government is bent on spending every cent it could possibly get on ill conceived infrastructure projects without actually doing the appropriate planning beforehand. As a result, they’re all going to be more expensive then they need to be and they’ll be riddled with faults that could have been resolved had they gone through the process properly. South Yarra, rarely going to the city but it does seem madness to take people the long way to the city. It’s a major pain to have to change trains to get to where you are going. I used to go from Hughesdale to Malvern quite a lot but now fewer trains stop at Malvern so I have to get off at Caulfield and wait for a Frankston line train just to go one stop. it can add 20 minutes to the journey, especially if you can’t sprint from one platform to another fast enough. I believe they should actually consult users before they make these decisions. Also, if Cranbourne line people will have to change at South Yarra to go directly to the city then it will add to the horrible squash at that station ( just after it has been slightly improved with the removal of the takeaway place at the top of the ramps and re-alignment of myki readers). I often catch the train to Richmond then swap to the Belgrave/Lilydale line to go to Camberwell or Canterbury. I don’t know if that will be possible with the proposed system unless I want to make a further line swap at South Yarra or go all the way to the city ( the long way). One last thing. I keep seeing references to this alignment being “the long way into the city” from South Yarra. Sure it’s not anything remotely like as the crow flies but it’s not actually much further between South Yarra and Southern Cross as the current path. A quick mock-up of the alignment in Google Earth shows approximately 5.6km from South Yarra to Southern Cross along the existing railway tracks via Richmond and Flinders Street. I’ve estimated 5.7km from South Yarra, to Domain, to Fisherman’s Bend to Southern Cross following the shape shown. Obviously this is a very rough method of checking the distance, but even if I’m out by a 30-40% the difference in distance isn’t so great, especially when you consider the new route will have less stops between South Yarra and Southern Cross. Of course if you’re aim is to get to Flinders St fast you’ll still want to change trains, but if we want a real metro style network, having to change trains comes with the territory. I was skeptical this tunnel being rerouted, but upon investigating it appears quite good. If I have read correctly Southern Cross will become Melbourne’s main station. The tunnel from South Yarra to Southern Cross will have 6 lines and Montague and Domain Stations will have 6 platforms each. The only other aspect that should be included is that from Burnley to Box Hill stations the tracks should be quadrupled as part of improving the overall system. @Myself – Fool Julian! The number of stops between South Yarra and Southern Cross would be exactly the same! @Julian, but that depends on whether you go via Flinders St or the underground stations!